To report nonnative fish and wildlife, call the FWC’s Exotic Species Hotline at 888-IVE-GOT1 (888-483-4681), report your sighting online at IveGot1.org or download the IveGot1 smartphone app. If you get bit by a snake or another animal, call 911 immediately.For more information on venomous snakes or animals, visit the Florida Poison Control Center at the link below, or in case of an emergency, dial 1-800-222-1222. ​Did You Know? 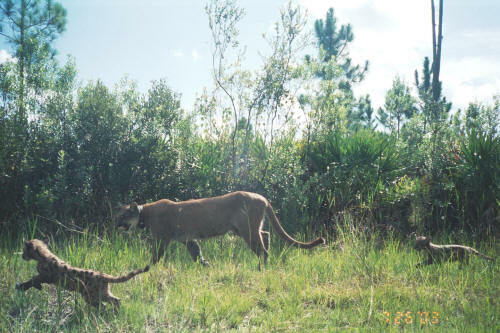 There are many pictures of panthers in trees because they are trying to escape from tracking dogs and scientists used to temporarily capture them for radio collaring and medical care. Although panthers spend most of their time on the ground, researchers have documented cases of panthers escaping to the trees to elude the advancements of amorous mates, and kittens will occasionally play and lounge in trees.